If one looks at the statistics from last Saturday they would see that we should not have won that game. Assumption doubled us both in yards and first downs and held on to the ball for 13 minutes longer than we did. However, football is not a game played with numbers on paper but with heart and desire on a football field. We had to call on every single player to put points on the board but the one who stood out by far was Stephan Neville. Our senior captain tied an NCAA record with his 11th career kick return for a touchdown and returned his first punt return for a touchdown in the fourth quarter to put us ahead with six minutes left. Both teams were tenacious throughout the entire game, creating one of the most exciting game atmospheres I have ever played in. This was not the season we expected. All season we have believed that we were a championship team and from my perspective looking ahead we still are. We will graduate some great players and teammates but that will just give others the opportunity to step up and be leaders next season. Those who are not graduating have already begun our work toward next season. Football never stops; it is a year-round way of life. Every day is an opportunity for us to get better and closer to a championship. No one can refute the heart and desire of this team. We poured our hearts out onto the field every weekend. We played in a way that would make our fallen brother Henry proud. He was as much part of this team as the rest of us were. Regardless of what our record may say or what the stats may suggest, we never stopped fighting and we honored Henry with our play on the field. At the end of the day, that is all that really mattered to us. 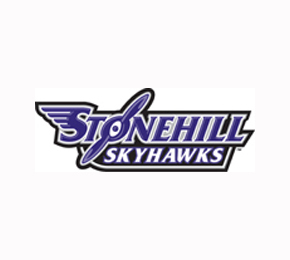 Stonehill defeated Saint Anselm 35-7 last Saturday. 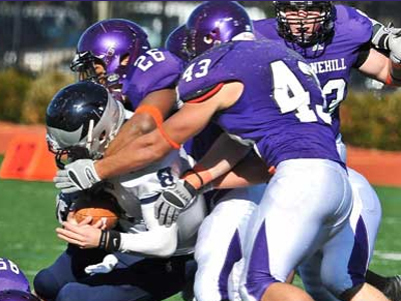 In our last chance to honor Henry at home this past weekend we faced off against Saint Anselm. We wore orange wristbands and used orange athletic tape to represent the fight against leukemia. In the days leading up to the game I began to think about Henry and the literal battle he went through against leukemia in the final months of his life. I realized that Henry was battling an enemy that he couldn’t see and still fought harder than I have ever seen. If Henry can fight for his life against an enemy that he couldn’t even see then we could certainly battle our enemy that was clearly dressed in blue and white on Saturday. are just grateful to have honored Henry this way with a victory in our last home game and to send the seniors off the right way. This feeling of victory is great and worth fighting for. There is no question that this is a fighting team and that we will keep delivering blows until the final whistle next Saturday. We’ve gone through the loss of family members, close friends and teammates over the past year and we owe it to them to fight to the end. Just as Henry fought until his last breath, we will fight until the clock strikes zero. With the popularization of the West Coast Offense, the game of football today has become more focused on making a flashy pass and catch rather than winning ball games. We have lost the toughness that used to be so apparent by bruising running games and filling the box with 8 guys on every play. Luckily, this past Saturday brought a snow storm through New Haven, Connecticut just in time for kick off. 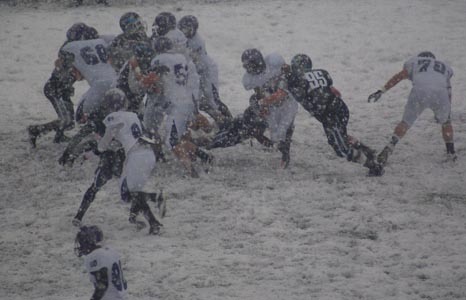 With three inches of snow on the ground and temperatures below 40 degrees, the game plan was thrown out the window and the only objective was to line up and hit someone. In conditions like that it all comes down to who wants it more and who is able stand firm together. It was not about being pretty or flashy it was about getting scrappy and doing whatever it takes to get the job done. gone. However, we have lost this toughness in the belief that we need beautiful California weather conditions and that we have throw the ball around the yard if we’re going to be successful. This past week was a perfect example of the football I love; the football that anyone can see on Thanksgiving morning or at the park or at lunch time at the local middle school. Both teams just flew around as best they could in those conditions and let their love of the game fuel the fight within them. Saturday was a brawl between neighborhood kids where the score is kept by who bleeds the least. It was pure and tough, the way football should be. We have three opportunities left to put on our armor and walk into battle together. Our only choice now is to lock our arms together and press further into the enemy’s territory. If we do not go out and play our best football we will be left with hearts filled with regret and that regret will be with us always. At this point all we have is each other, leaving us with nothing to fear. We will not fear our opponent’s territory this weekend because we know we can win anywhere. We will not fear our opponent’s weapons because we have all the artillery we need to win this battle. And we will not fear the individuals we face because we are a team that wins and loses together. A team that lives and dies together. It is rare to get a second chance in this life. It is even more precious when a second chance is offered on the football field. Usually when a team loses a game they believe they shouldn’t have, they have to wait a whole year before they can hit those guys again. We were fortunate enough to get a second chance to avenge our poor performance from earlier this year. We came out with the mindset that no one will get in the way of us accomplishing the goals we have set for ourselves. Our offensive line did a great job controlling the line of scrimmage and creating running lanes for our running backs Jamal Johnson and Jermetrius Troy to find the end zone on multiple occasions. Defensively the biggest difference between this game and our first match up against Pace was our ability to execute our game plan. We did exactly what we wanted. Yes this feels good to be back in the win column but we understand that there are still plenty of things for us to improve on. We will still break down the game and find what we need to fix. The effort has been there all season and we have believed that we could win every game this season. The only difference with this game is how we executed our game plan. If we can execute like that we will win the rest of the games on our schedule. When one looks up the differences between a Division I football program and a Division II football program, they will find that a lot of those differences have to do with scholarship money and attendance minimums. Nowhere will it say that a Division I school is somehow more athletic or automatically better at football than a Division II team. This week we went Rhode Island to play a Division I-AA school believing we are just as good if not better than they are. Even with the majority of key role players on our team being out due to injury, we still believed that the team we suited up was just more than capable of beating the team on the other sideline. No one will hear us use that as an excuse though simply because it is not. All these cards were stacked against us and we still believed that we had a better team. However, we only showed glimpses of that. We would put together a good string of plays only to eventually make one big mistake that would prevent any momentum from building in our favor. We made them work for everything until eventually they would just break free for a big play. I have said a lot about this team. I could claim that we are better than 1-5 but the fact is that no one will believe that until it starts showing on the scoreboard. I am perfectly all right with no one believing in us. We have each other and that is all we need. We are brothers and from cancer to five-game losing streaks, we will stand by each other through it all. afternoon but we want to do whatever it takes to overcome this adversity and make sure that what happened against New Haven will not happen again. to break their arrows in half. Once they had all done this with ease, he took ten of those half arrows and tied them all together. Then he passed those ten that were tied together and asked if any of his warriors could snap the whole group. They couldn’t. He then told them that an army that fights together will never fall. We will lock our arms and march into battle every Saturday knowing that the man next to us is going to do his job for the good of the team and not his own individual glory. 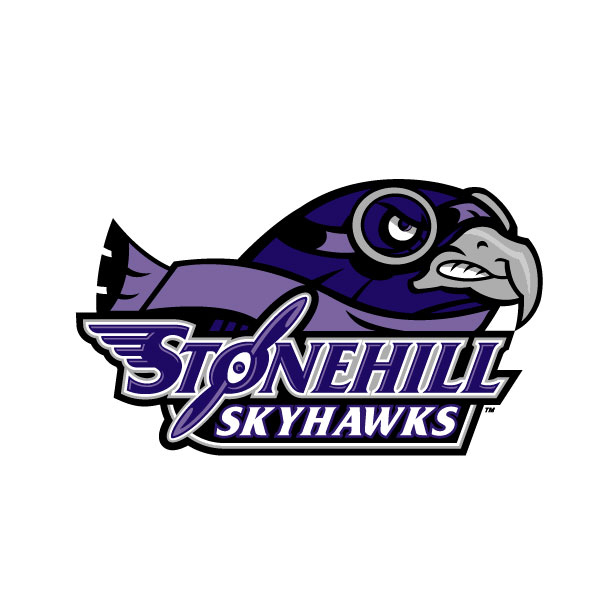 One will not see a single Skyhawk hang their head or blame another teammate. We don’t do that. We have more character than that. We have more integrity than that. This team will overcome the adversity and this team will do the little things to get back to where it knows it can be. We are a team and together we can take down any opponent. But individually we crumble.